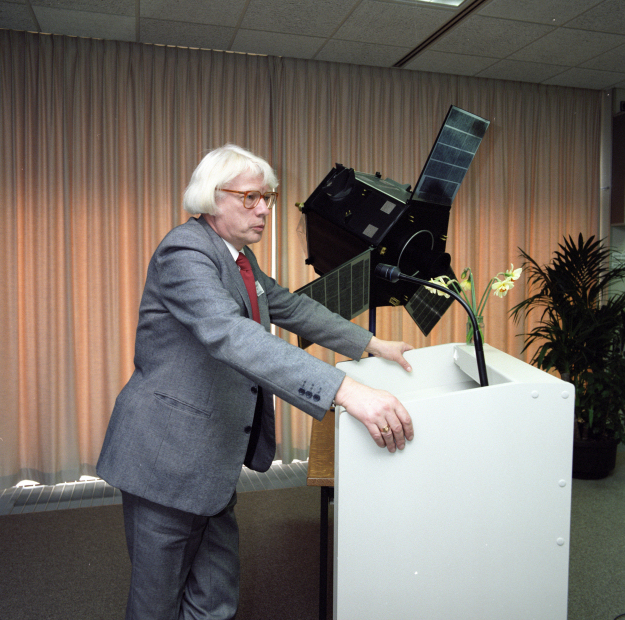 Jean Kovalevsky at the International Hipparcos Press Conference, 11 April 1988. Jean Kovalevsky (Observatoire de la Côte d'Azur, France) led the Hipparcos FAST (Fundamental Astronomy by Space Techniques) Consortium from 982 to 1997). At the press conference, Reimar Lüst (ESA Director General from 1984-1990) received the Hipparcos Input Catalogue on behalf of ESA, in the presence of members of the Hipparcos science community and ESA Hipparcos team members. The Hipparcos Input Catalogue formed the mission's observing programme: it contained over 100 000 target stars that Hipparcos would monitor to obtain their astrometric properties.